As a builder, contractor and developer, I’ve been constructing new homes in Texas for over 35 years – by now. We’ve built more than a few thousand. Along the way, we’ve come to understand what makes a house a great house – and what makes a great house a real home. For us, that’s a high standard of design, quality and community – something that adds up to what I call livability. Among his many leadership assignments in the home building industry, Wes was a founding partner in Wilshire Homes, and served as a senior officer for Hammonds Homes and the Meritage Corporation, leading both companies to some of their greatest successes. The passion Wes has for community building and his genuine respect for others translates into a practical ability to connect with and bring people together. His ability to generate trust and build consensus between individuals, governmental, business and community groups with divergent interests has earned Wes a bookcase full of honors. Most recently he was awarded the distinguished Ethics in Business Award given by the Samaritan Center and Concordia University Texas and was appointed Chair of the Board of Regents for Texas Lutheran University, his alma mater. He and his wife Karen, have worked for over 15 years to help raise funds for pediatric mental health care at the Dell Children’s Medical Center of Central Texas. This work through the Northwest Austin Circle of Friends recently culminated in the opening of the Grace Grego Maxwell Mental Health Unit at Dell Children’s Medical Center on May 21st, 2018. Wes Peoples Homes also annually donates funds to such charities as American Heart Association, Ronald McDonald House, KLRU, Paramount Theatre, and Foundation Communities. 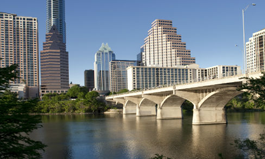 Wes also has served as President of the Austin Homebuilders Association on two occasions. Along the way, Wes developed a rock solid belief that a home is important to the fabric of daily life and that home ownership contributes to a sense of self worth and dignity. He came to understand deeply what it takes to design and build homes and communities in a way that strengthens families and positively shapes neighborhoods which enrich a city’s growth in a meaningful way. He is dedicated to building homes and communities that make positive contributions to homeowners and to the communities where those homes are built. It’s our commitment that Wes Peoples Homes will be building some of the smartest design-savvy, sustainably conscious new homes in Austin and surrounding communities. We hope you will explore one that interests you. Whether you want to live minutes from downtown Austin or in a not-so-urban setting that still has Austin soul, We’re confident that in a new Wes Peoples Home you’ll find a great – and greener – home and a real community in the location you’ve been looking for. Come visit our new communities soon and we think you’ll understand why we believe you’ll enjoy living in a Wes Peoples Home more than you could possibly imagine! Wes and his team look forward to building a new home for you.